John and I stumbled on the Elkmont Historic District in Great Smoky Mountain National Park today. 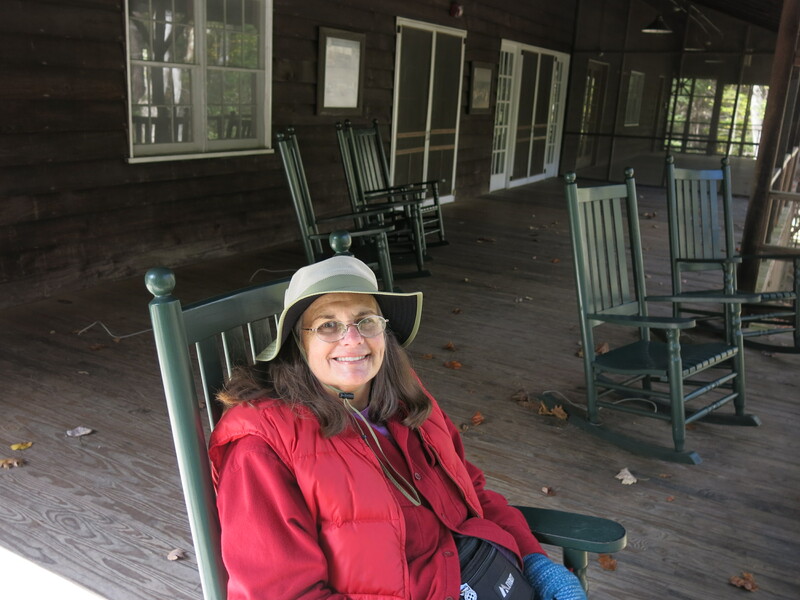 I found it fascinating, and just walking down the streets of vacation cabins from the 1920s, it was easy to imagine life back then for wealthy families from Knoxville spending their summers in a cooler climate. I was surprised to learn of the cabins’ existence, as I thought all structures except for those open to the public had been torn down long ago. We weren’t supposed to go in the buildings (although most visitors were ignoring that sign) but we could look through the windows, and walk up and down the street looking at the cabins. The Little River Lumber Company established the town of Elkmont in 1908 as a base for its logging operations in the upper Little River and Jakes Creek areas. By 1910, the Lumber company began selling plots of land to hunting and fishing enthusiasts from Knoxville, who established the “Appalachian Club” just south of the logging town. In 1912, a resort hotel, the Wonderland Park Hotel, was constructed on a hill overlooking Elkmont. A group of Knoxvillle businessmen purchased the Wonderland in 1919 and established the “Wonderland Club.” Over the next two decades, the Appalachian Club and Wonderland Club evolved into elite vacation areas where East Tennessee’s wealthy could gather and socialize. 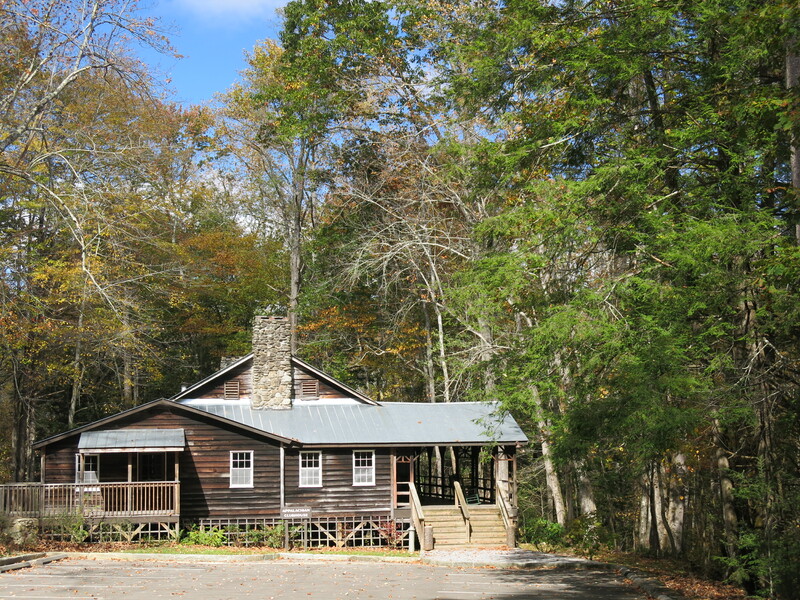 Upon the creation of the National Park in the 1930s, most of Elkmont’s cabin owners were given lifetime leases. These were converted to twenty year leases in 1952, and renewed in 1972. The National Park Service refused to renew the leases in 1992, and under the park’s general management plan, the hotel and cottages were to be removed. 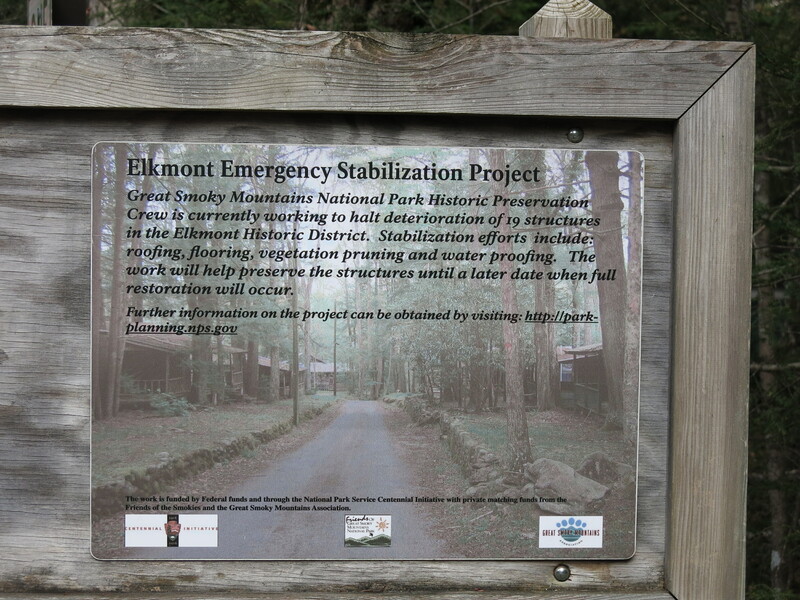 The problem with their plans was that by 1994, the Wonderland Hotel and several dozen of the Elkmont cabins were listed on the National Register of Historic Places as Elkmont Historic District, Great Smoky Mountains National Park. This began a 15-year discussion about the future of the historic structures. 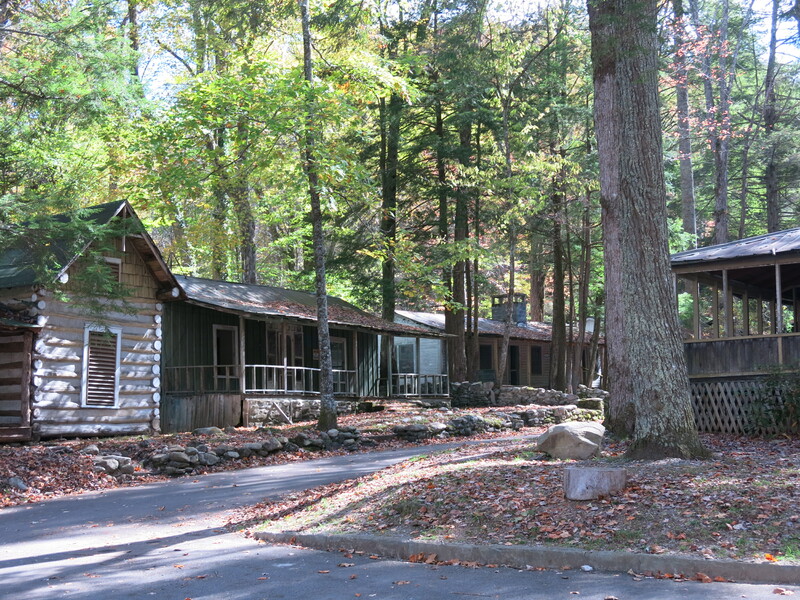 In 2009, the National Park Service announced plans to restore the Appalachian Clubhouse and 18 cabins and outbuildings in the Appalachian Club area. The buildings in this area were older and more historically significant. All other buildings, including the Wonderland Annex were torn down. The main Wonderland Hotel had collapsed in 2005. On the way back to our campsite, we took the Roaring Fork Motor Trail, due to close down the end of the month for six months to replace 8 bridges along the trail. 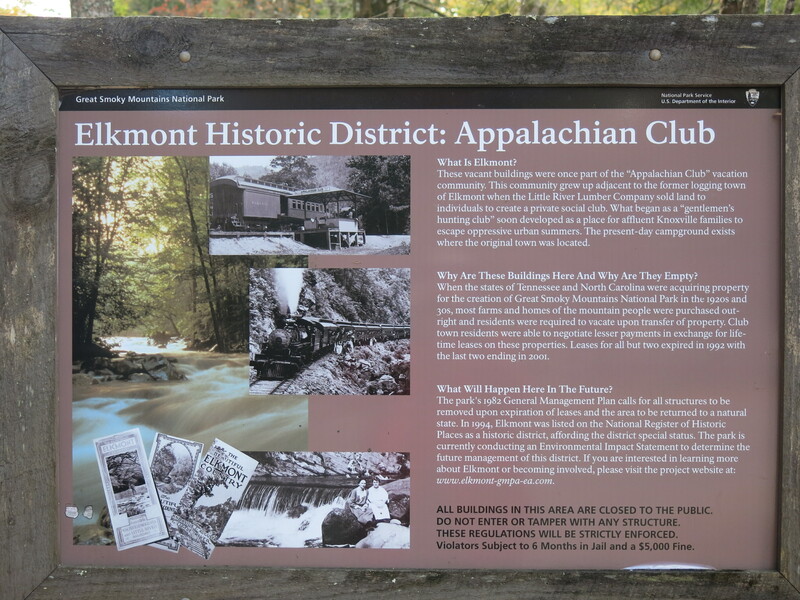 This entry was posted in Great Smoky Mtn NP, Historical Buildings, History and tagged Elkmont Historic District. Bookmark the permalink. Very interesting. It is always nice to stumble on to something new. There is a cold front coming in this weekend, I guess it will be affecting you guys as well. Will probably be pretty cold in the mountains, might need an extra quilt. Sherry, John is hooking up the fifth wheel as I write. We are heading home for Halloween with the kids and Hank’s birthday party Sunday. I am really looking forward to seeing them all. Love this Historic District! So glad the park is going to restore many of the buildings. Great find on your travels. I’m with Ingrid…if those walls could talk!